aLL Design’s vision for this Thames estuary town will reposition it nationally as well as adding to London’s burgeoning reputation as international hub for filmmaking and the creative industries. The project was won through a bidding process, which saw the design praised by the local authority for its innovative approach to placemaking. 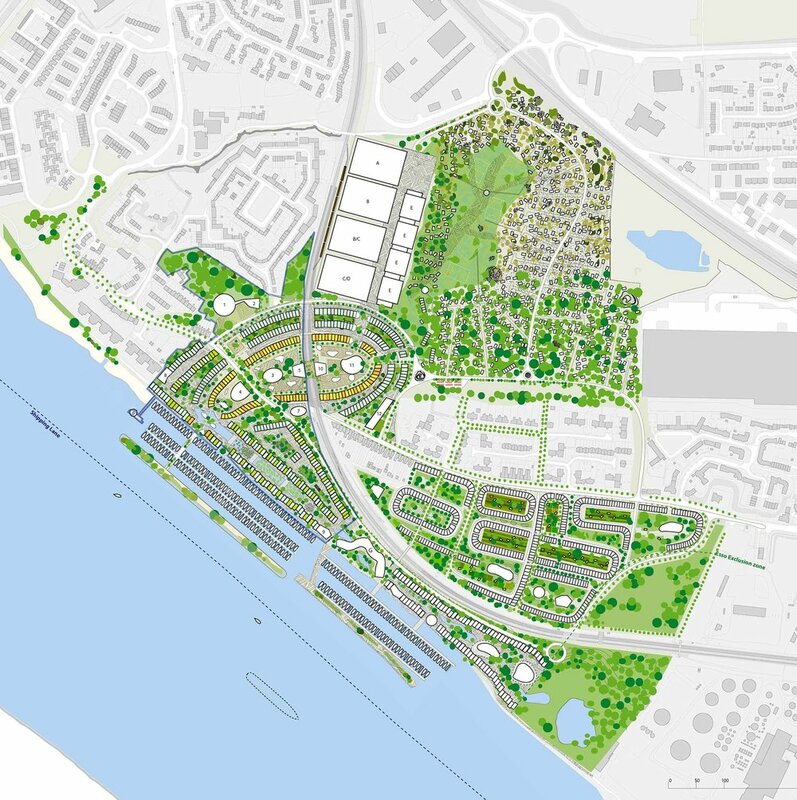 aLL’s proposals for Purfleet seek to transform the area and create a desirable and more sustainable place to live and work. The layout embraces the principles of prioritising pedestrians, managing vehicle traffic better and bridging the railway line. This will allow easier and safer movement between neighbourhoods encouraging people to move freely through the site and along the riverfront. There will be a dense built environment in the centre but with open space, parks, gardens and water features at many places across the site. aLL’s vision will reunite the different parts of the town via a sloping town square, which will allow residents to the north of the railway to freely access the riverfront. 2500 new homes encircle this new town centre, each focusing on a series of squares and water parks. A quarry to the north of the town centre will be heavily planted and scattered with lightweight eco houses. A new entertainment village will contain film and television studios set to surpass Pinewood as the UK’s studios of choice, and the town centre will compliment this with buildings for start-ups, postproduction and screenings. A series of housing typologies vary the residential mix as well as providing a changing roofscape which draws on Cornish fishing villages as precedents. A patchwork of sizes, materials and rooflines will make for more interesting views across the site, with each house type offering different types of amenity space. Construction on the first phase is due to start in 2017.